The following are blocks of HTML code that you can use to link directly to the Sam Diegos website. Simply copy all of the contents of the box of your choice and paste the code into the desired location on your website. If you don't understand these instructions then let your webmaster know about this page and they will take care of adding the link for you. 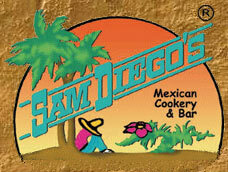 Sam Diegos Mexican Cookery and Bar is the Place to Go for Food, Fun and Fiesta on Cape Cod and in Plymouth. <strong><a href="http://www.samdiegos.com" title="Sam Diegos: Sam Diegos Mexican Cookery and Bar is the Place to Go for Food, Fun and Fiesta on Cape Cod and in Plymouth. ">Sam Diegos</a></strong><br />Sam Diegos Mexican Cookery and Bar is the Place to Go for Food, Fun and Fiesta on Cape Cod and in Plymouth.